"NIH" redirects here. For other uses, see NIH (disambiguation). NIH's roots extend back to the Marine Hospital Service in the late 1790s that provided medical relief to sick and disabled men in the U.S. Navy. By 1870, a network of marine hospitals had developed and was placed under the charge of a medical officer within the Bureau of the Treasury Department. In the late 1870s, Congress allocated funds to investigate the causes of epidemics like cholera and yellow fever, and it created the National Board of Health, making medical research an official government initiative. In 1967, the Division of Regional Medical Programs was created to administer grants for research for heart disease, cancer, and strokes. That same year, the NIH director lobbied the White House for increased federal funding in order to increase research and the speed with which health benefits could be brought to the people. An advisory committee was formed to oversee further development of the NIH and its research programs. By 1971 cancer research was in full force and President Nixon signed the National Cancer Act, initiating a National Cancer Program, President's Cancer Panel, National Cancer Advisory Board, and 15 new research, training, and demonstration centers. Funding for the NIH has often been a source of contention in Congress, serving as a proxy for the political currents of the time. In 1992, the NIH encompassed nearly 1 percent of the federal government's operating budget and controlled more than 50 percent of all funding for health research, and 85 percent of all funding for health studies in universities. While government funding for research in other disciplines has been increasing at a rate similar to inflation since the 1970s, research funding for the NIH nearly tripled through the 1990s and early 2000s, but has remained relatively stagnant since then. In 2008 a Congressional mandate called for investigators funded by the NIH to submit an electronic version of their final manuscripts to the National Library of Medicine's research repository, PubMed Central (PMC), no later than 12 months after the official date of publication. The NIH Public Access Policy was the first public access mandate for a U.S. public funding agency. On February 13, 2012, the National Institutes of Health (NIH) announced a new group of individuals assigned to research pain. This committee is composed of researchers from different organizations and will focus to "coordinate pain research activities across the federal government with the goals of stimulating pain research collaboration… and providing an important avenue for public involvement" ("Members of new," 2012). With a committee such as this research will not be conducted by each individual organization or person but instead a collaborating group which will increase the information available. With this hopefully more pain management will be available including techniques for arthritis sufferers. In 2000, the Joint Economic Committee of Congress reported NIH research, which was funded at $16 billion a year in 2000, that some econometric studies had given a rate of return of 25 to 40 percent per year by reducing the economic cost of illness in the US. It found that of the 21 drugs with the highest therapeutic impact on society introduced between 1965 and 1992, public funding was "instrumental" for 15. As of 2011 NIH-supported research helped to discover 153 new FDA-approved drugs, vaccines, and new indications for drugs in the 40 years prior. One study found NIH funding aided either directly or indirectly in developing the drugs or drug targets for all of the 210 FDA-approved drugs from 2010 to 2016. In 2015, Pierre Azoulay et al. estimated $10 million invested in research generated two to three new patents. 1908 – George W. McCoy's discovery that rodents were a reservoir of bubonic plague. 1960s – Developed an effective combination drug regimen for Hodgkin's lymphoma. To allocate funds, the NIH must first obtain its budget from Congress. This process begins with institute and center (IC) leaders collaborating with scientists to determine the most important and promising research areas within their fields. IC leaders discuss research areas with NIH management who then develops a budget request for continuing projects, new research proposals, and new initiatives from the Director. NIH submits its budget request to the Department of Health and Human Services (HHS), and the HHS considers this request as a portion of its budget. Many adjustments and appeals occur between NIH and HHS before the agency submits NIH's budget request to the Office of Management and Budget (OMB). OMB determines what amounts and research areas are approved for incorporation into the President's final budget. The President then sends NIH's budget request to Congress in February for the next fiscal year's allocations. The House and Senate Appropriations Subcommittees deliberate and by fall, Congress usually appropriates funding. This process takes approximately 18 months before the NIH can allocate any actual funds. Funding for the NIH has often been a source of contention in Congress, serving as a proxy for the political currents of the time. During the 1980s, President Reagan repeatedly tried to cut funding for research, only to see Congress partly restore funding. The political contention over NIH funding slowed the nation's response to the AIDS epidemic; while AIDS was reported in newspaper articles from 1981, no funding was provided for research on the disease. In 1984 National Cancer Institute scientists found implications that "variants of a human cancer virus called HTLV-III are the primary cause of acquired immunodeficiency syndrome (AIDS)," a new epidemic that gripped the nation. In 1992, the NIH encompassed nearly 1 percent of the federal government's operating budget and controlled more than 50 percent of all funding for health research and 85 percent of all funding for health studies in universities. From 1993 to 2001 the NIH budget doubled. Since then, funding essentially remained flat, and during the decade following the financial crisis, the NIH budget struggled to keep up with inflation. In 1999 Congress increased the NIH's budget by $2.3 billion to $17.2 billion in 2000. In 2009 Congress again increased the NIH budget to $31 billion in 2010. In 2017 and 2018, despite President Trump's proposals to cut the NIH budget, Congress passed laws with bipartisan support that substantially increasing appropriations for NIH, which was 37.3 billion dollars annually in FY2018. Researchers at universities or other institutions outside of NIH can apply for research project grants (RPGs) from the NIH. There are numerous funding mechanisms for different project types (e.g., basic research, clinical research etc.) and career stages (e.g., early career, postdoc fellowships etc.). The NIH regularly issues "requests for applications" (RFAs), e.g., on specific programmatic priorities or timely medical problems (such as Zika virus research in early 2016). In addition, researchers can apply for "investigator-initiated grants" whose subject is determined by the scientist. The total number of applicants has increased substantially, from about 60,000 investigators who had applied during the period from 1999 to 2003 to slightly less than 90,000 in who had applied during the period from 2011 to 2015. Due to this, the "cumulative investigator rate," that is, the likelihood that unique investigators are funded over a 5-year window, has declined from 43% to 31%. One of the goals of the NIH is to "expand the base in medical and associated sciences in order to ensure a continued high return on the public investment in research." Taxpayer dollars funding NIH are from the taxpayers, making them the primary beneficiaries of advances in research. Thus, the general public is a key stakeholder in the decisions resulting from the NIH funding policy. However, some in the general public do not feel their interests are being represented, and individuals have formed patient advocacy groups to represent their own interests. ^ Baye, Rachel (October 17, 2012). "NIH plans to move 3,000 employees to Bethesda campus". Washington Examiner. Archived from the original on March 17, 2018. ^ "Trump, Congress approve largest U.S. research spending increase in a decade". Science AAAS. March 23, 2018. Archived from the original on March 23, 2018. Retrieved March 24, 2018. ^ "Appropriations (Section 2)". The NIH Almanac (Report). National Institutes of Health. February 25, 2011. Archived from the original on October 31, 2015. Retrieved August 26, 2011. ^ "Organization and Leadership | NIH Intramural Research Program". Irp.nih.gov. April 4, 2011. Archived from the original on April 24, 2013. Retrieved April 28, 2013. ^ Osterweil, Neil (September 20, 2005). "Medical Research Spending Doubled Over Past Decade". MedPage Today. Archived from the original on October 16, 2015. Retrieved September 15, 2015. ^ Harden, Victoria A. "WWI and the Ransdell Act of 1930". A Short History of the National Institutes of Health. Office Of History National Institutes Of Health, United States National Institutes of Health. Archived from the original on September 7, 2011. Retrieved September 12, 2011. 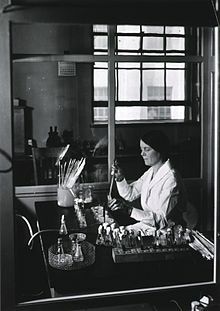 ^ "A Short History of the National Institutes of Health (1 of 13)". history.nih.gov. Archived from the original on May 15, 2011. Retrieved May 25, 2011. ^ "SIC 9431 Administration of Public Health Programs". Referenceforbusiness.com. Archived from the original on May 10, 2011. Retrieved May 25, 2011. ^ "History of the National Cancer Institute". National Cancer Institute – National Institutes of Health. March 18, 2015. Archived from the original on June 28, 2017. Retrieved June 29, 2017. ^ a b Laurie J. Price (1992). "A Medical Anthropologist's Ruminations on NIH Funding". Medical Anthropology Quarterly. New Series. 6 (2): 128–146. doi:10.1525/maq.1992.6.2.02a00030. JSTOR 649307. ^ "Historical Trends in Federal R&D". AAAS - The World's Largest General Scientific Society. June 11, 2013. Archived from the original on January 10, 2018. ^ "Online Education Kit: 1990: Launch of the Human Genome Project". National Human Genome Research Institute (NHGRI). Retrieved November 26, 2018. ^ "NIH Leadership". 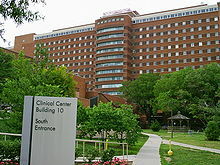 National Institutes of Health (NIH). October 31, 2014. Retrieved March 18, 2019. This article incorporates text from this source, which is in the public domain. ^ "The NIH Directors". National Institutes of Health. February 11, 2015. Archived from the original on June 1, 2013. ^ "Bayview Campus". nih.gov. May 8, 2013. Archived from the original on September 5, 2017. Retrieved May 7, 2018. ^ "NCI at Frederick: About the NCI at Frederick". ncifrederick.cancer.gov. Archived from the original on January 10, 2018. ^ "Division of Intramural Research Overview". National Institute of Allergy and Infectious Diseases. September 1, 2010. Archived from the original on March 8, 2010. Retrieved September 15, 2015. ^ "Lasker Awards". National Institutes of Health (NIH). February 5, 2016. Archived from the original on July 5, 2016. ^ "NIH Budget". National Institutes of Health. National Institutes of Health. May 23, 2011. Archived from the original on August 26, 2011. Retrieved August 26, 2011. ^ "Estimates of Funding for Various Research, Condition, and Disease Categories (RCDC)". Research Portfolio Online Reporting Tools. National Institutes of Health. March 15, 2011. Archived from the original on August 13, 2011. Retrieved August 26, 2011. ^ National Institutes of Health. "NIH Public Access Policy Details". National Institutes of Health. Archived from the original on November 3, 2011. Retrieved January 30, 2014. ^ Suber, Peter (April 16, 2008). "An open access mandate for the National Institutes of Health". Open Medicine. 2 (2): e39–41. PMC 3090178. PMID 21602938. ^ "The Benefits of Medical Research and the Role of the NIH" (PDF). U.S. Joint Economic Committee. May 2000. Archived from the original (PDF) on April 12, 2015. Retrieved May 25, 2011. ^ Stevens, A. J.; Jensen, J. J.; Wyller, K.; Kilgore, P. C.; Chatterjee, S.; Rohrbaugh, M. L. (2011). "The Role of Public-Sector Research in the Discovery of Drugs and Vaccines". New England Journal of Medicine. 364 (6): 535–541. doi:10.1056/NEJMsa1008268. PMID 21306239. ^ "NIH funding contributed to 210 approved drugs in recent years, study says". statnews.com. February 12, 2018. Archived from the original on March 22, 2018. Retrieved May 7, 2018. ^ Azoulay, Pierre; Graff Zivin, Joshua S.; Li, Danielle; Sampat, Bhaven N. (January 2015). "Public R&D Investments and Private-sector Patenting: Evidence from NIH Funding Rules". NBER Working Paper No. 20889. doi:10.3386/w20889. ^ "Appropriations". National Institutes of Health (NIH). Retrieved March 17, 2019. ^ "Funding" (PDF). Archived (PDF) from the original on March 4, 2016. ^ "Funding". Archived from the original on December 7, 2011. ^ a b "Funding" (PDF). Archived (PDF) from the original on February 15, 2013. ^ "NIH Funding: FY1994-FY2019" (PDF). Congressional Research Service. Retrieved March 17, 2017. ^ a b Lauer, Mike (May 31, 2016). "How Many Researchers?". Open Mike. NIH. Archived from the original on August 25, 2016. Retrieved June 6, 2016. ^ Rockey, Sally (April 10, 2015). "Looking at Recent Data on R21 and R01-equivalent Grants". Rock Talk. NIH. Archived from the original on October 8, 2016. Retrieved October 2, 2016. ^ a b "NIH Research Portfolio Online Reporting Tools (RePORT)". report.nih.gov. Archived from the original on February 2, 2018. ^ "Statement on Funding Allocation for Disease Research by Harold Varmus, M. D., Director, National Institutes of Health". Assistant Secretary for Legislation, Department of Health and Human Services. May 6, 1999. ^ "National Advisory Neurological Disorders and Stroke Council (NANDSC)". Ninds.nih.gov. Archived from the original on April 28, 2013. Retrieved April 28, 2013. ^ a b Rabin, Roni Caryn (May 14, 2014). "Labs Are Told to Start Including a Neglected Variable: Females". The New York Times. Archived from the original on September 6, 2015. Retrieved September 10, 2015. ^ Sabrina Tavernese (October 9, 2013). "Clinical Trials Continue, but Only at a Crawl". New York Times. Archived from the original on October 27, 2017. ^ Neergaard, Lauran (October 9, 2013). "NIH admits a dozen critically ill, making exceptions to no-new-patient policy during shutdown". Huffington Post. The Associated Press. Archived from the original on March 1, 2017. Retrieved September 10, 2015. ^ "Government slimdown blocks some seeking NIH research treatment". Fox News Channel. The Associated Press. October 2, 2013. Archived from the original on October 5, 2013. ^ "Department of Health and Human Services Fiscal Year 2014 Contingency Staffing Plan for Operations in the Absence of Enacted Annual Appropriations" (PDF). Archived from the original (PDF) on October 28, 2013. ^ "Stakeholders". October 31, 2014. Archived from the original on November 25, 2011. ^ "Stakeholders". Archived from the original on November 14, 2011. ^ "Stakeholders". Archived from the original on November 4, 2016. ^ Karp PD, Sherlock G, Gerlt JA, Sim I, Paulsen I, Babbitt PC, Laderoute K, Hunter L, Sternberg P, Wooley J, Bourne PE (2008). "Changes to NIH grant system may backfire". Science. 322 (5905): 1187–8. doi:10.1126/science.322.5905.1187c. PMID 19023064. ^ Costello LC (May 2010). "Perspective: is NIH funding the "best science by the best scientists"? A critique of the NIH R01 research grant review policies". Acad Med. 85 (5): 775–9. doi:10.1097/ACM.0b013e3181d74256. PMID 20520024. ^ "Appropriations Funding for National Institute of Allergy and Infectious Diseases Contract N01-AI-15416 With the University of California at San Francisco Audit (A-03-10-03120)" (PDF). June 2011. Archived (PDF) from the original on October 15, 2011. Retrieved June 25, 2011. "Appropriations Funding for National Institute of Allergy and Infectious Diseases Contract N01-AI-3-0052 With Avecia Biologics Limited" (PDF). September 2011. Archived (PDF) from the original on October 15, 2011. Retrieved October 9, 2011. "Appropriations Funding for National Institute of Allergy and Infectious Diseases Contract HHSN266-2006-00015C With NexBio, Inc" (PDF). September 2011. Archived (PDF) from the original on October 15, 2011. Retrieved October 9, 2011. "Appropriations Funding for National Institute of Allergy and Infectious Diseases Contract HHSN272-2008-00013C with the EMMES Corporation (A-03-10-03115)" (PDF). October 2011. Archived (PDF) from the original on June 2, 2013. Retrieved September 11, 2011. "Appropriations Funding for Eunice Kennedy Shriver National Institute of Child Health and Human Development Contract HHSN275-03-3345 With Westat, Inc. Audit (A-03-10-03106)" (PDF). October 2011. Archived (PDF) from the original on June 1, 2013. Retrieved November 20, 2011. "Appropriations Funding for National Institute on Drug Abuse Contract HHSN271-2007-00009C with Charles River Laboratories, Inc. (A-03-10-03104)" (PDF). October 2011. Archived (PDF) from the original on June 2, 2013. Retrieved November 22, 2011. "Appropriations Funding for National Institute of Allergy and Infectious Diseases Contract HHSN266-2005-00022C With PPD Development, LP (Audit A-03-10-03118)" (PDF). September 2012. Archived (PDF) from the original on May 22, 2013. Retrieved September 26, 2012. "Appropriations Funding for National Institute of Allergy and Infectious Diseases Contract N01-AI-30068 With PPD Development, LP (Audit A-03-10-03116)" (PDF). September 2012. Archived (PDF) from the original on May 22, 2013. Retrieved September 26, 2011. Wikimedia Commons has media related to National Institutes of Health. This page was last edited on 29 March 2019, at 14:10 (UTC).